Christianity and other barbaric ways. The reality of Islam in all its hatred can be seen in Afghanistan, the Maldives, Saudi Arabia, Somalia, Yemen, and a few other nations, where converts from Islam face the death penalty. 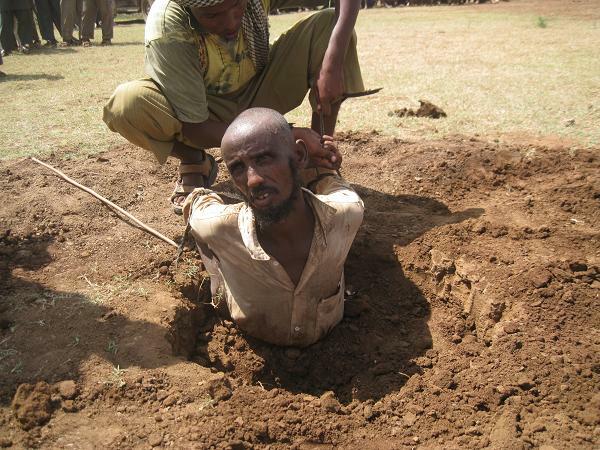 In Somalia, the Sunni Islamic fanatics called the Al-Shabaab (Al-Shabab) have once more killed a convert to Christianity and in true style the soldiers of Islam held down a Christian lady and slit her throat in front of many villagers. This hatred is clearly based on the teachings of Mohammed because he supported killing apostates and the ongoing Islamic inquisition continues in nations like Somalia. Religious minorities in so many nations are facing the Islamic sword and often it is difficult to notice the difference between Islamic jihadists who slit the throats and behead innocents in order to appease Allah or national governments which support killing apostates. After all, the Al-Shabaab in Somalia and the Taliban in Afghanistan support killing apostates and these groups are deemed to be Sunni Islamic fanatics. However, government elites and the legal system also support killing apostates in both Afghanistan and Somalia. Therefore, it is difficult to notice the difference in some nations because Islamic hatred is being installed on all sides, irrespective if they are Sunni Islamic jihadists or national governments. The same problem of religious intolerance and discrimination is factual within nations like Egypt where Coptic Christians suffer from institutional discrimination and in Pakistan it is clear that Ahmadiyya Muslims, Christians, Hindus, and Sikhs, reside in fear because of blasphemy laws and mass discrimination. Therefore, on January 7th in 2011 the holy warriors of Islam captured a Christian mother of four and slaughtered her in front of many villagers in Warbhigly in Somalia. Like usual the Koran holding individuals will have been shouting Allah Akbar while cutting the throat of Asha Mberwa. The 36 year old Asha Mberwa was a mother of four and she had committed no crime and had harmed nobody. However, Mohammed supported the killing of apostates therefore the Al-Shabaab killed the Muslim convert to Christianity in order to appease the Islamic god. In true Islamic justice an innocent convert to Christianity was killed in cold blood and bystanders were forced to watch while her throat was being cut. Her death, like so many other Christian martyrs in Somalia, is a witness to the reality of Islamic Sharia law and the brutal teachings of Mohammed. Therefore, the Islamic inquisition is in full swing in Somalia and Christians are being hunted down and killed. The reality of modern day Afghanistan and Somalia is the same reality which befell the Buddhists and Hindus of Afghanistan in history. If we look at the modern Islamic inquisition in Somalia then we can imagine how Buddhism and Hinduism were destroyed in Afghanistan. Hindus also face complete annihilation in modern day Kashmir and the Hindu population in Pakistan is in freefall. The same applies to ongoing persecution in Bangladesh of Buddhists in the Chittagong Hill Tracts and Hindus throughout this nation. It should also be noted that it is abundantly clear that many members of Al-Shabaab have been brought up in nations like America and the United Kingdom. Therefore, the multi-religious agenda of equality is clearly failing and Muslims who are joining Al-Shabaab in the West appear to have a different Koran to that of the liberals or appeasers of Islam. However, the Koran of these Muslims is based on the real texts of Islam and they fully understand the Hadiths and all the quotes that justify killing apostates and enforcing Islamic Sharia law. Al-Shabaab is being supplied with manpower both internally and externally and the terrorist attack in Uganda is clear evidence that this Islamic movement is intent on spreading Islam and terror to other nations. Therefore, the Al-Shabaab is clearly causing concerns throughout the region. Also, returning Islamic jihadists to America, the United Kingdom, and other nations, may spread their terrorism and objectives because the Islamic terrorist conveyor belt is ongoing. Therefore, the ongoing Islamic inquisition in Somalia is being supported by Muslims who once resided in America, Canada, the United Kingdom, Sweden, and other nations. It is abundantly clear that Muslims or converts to Islam who have joined Al-Shabaab have rejected all notions of religious pluralism, democracy, and liberalism. Instead, they have joined a Sunni Islamic group which supports killing all converts to Christianity, stoning women to death, chopping hands and feet off, and other crimes against humanity. Asha Mberwa is the latest Christian martyr in Somalia to be killed by the followers of Islam who follow Islamic Sharia law, the teachings of the Koran and the Hadiths. This innocent Christian lady was killed by Muslims reciting the Koran and her death was slow and with the knowledge that the same Islamic fanatics would try to find her children and indoctrinate them. It appears that the Christians of Somalia have been abandoned and if we look into the mirror then this Islamic inquisition is the same Islamic inquisition which befell the Buddhists and Hindus of Afghanistan in past history. Sadly, the annihilation of non-Muslim faiths is still being allowed but this darkness is not only a tragedy and a crime against humanity; it will also encourage Islamic jihadists to spread their hatred to new nations. Currently it appears that the “light” of Asha Mberwa and religious freedom is being allowed to be defeated by the forces of “Islamic darkness” which desires complete Islamization in Somalia.